THE PICKIEST EATER IN THE WORLD: BEST. GIFT. EVER. What's the best pasalubong you've ever gotten? Most people get shoes, shirts, or caps. People look forward to getting balikbayan boxes filled with goodies, like perfumes and chocolates, all from a loved one thousands of miles away.
. But not me. Such trivial trinkets don't really do it for me. I'm thankful I have a Godmother in the States who knows me so well, and is well aware that as grateful as I would be for anything she'd give me, I wouldn't be going bonkers over a hat. Don't get me wrong.. I love getting shirts, shoes and caps as much as the next guy, but my Godmother sent me a package together with my cousin that completely blew my mind away. It became the Barometer that all future Pasalubongs would be measured by. And I don't think anything in this world could come close to it. In fact, tears are welling up in my eyes as I am typing this, just at the memory of what a wonderful gift it was.. Especially when it's so good, it's in the "Best Thing Ever" Hall Of Fame. Apparently my audition for a role in "American Beauty" didn't go so well.. 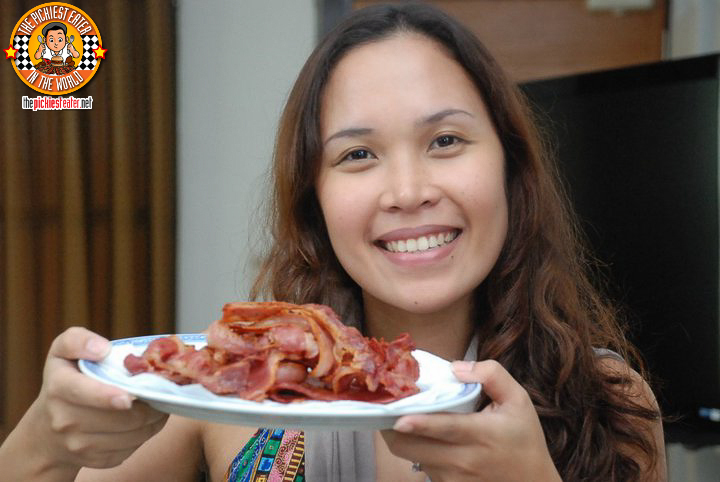 Yes, my Ninang Pochay sent me Bacon. "But you can get bacon here! ", you might say. Yes you can, my young Padawan, But guess what? She sent me FIVE KINDS OF BACON. Five kinds that I can assure you, you will not find here. 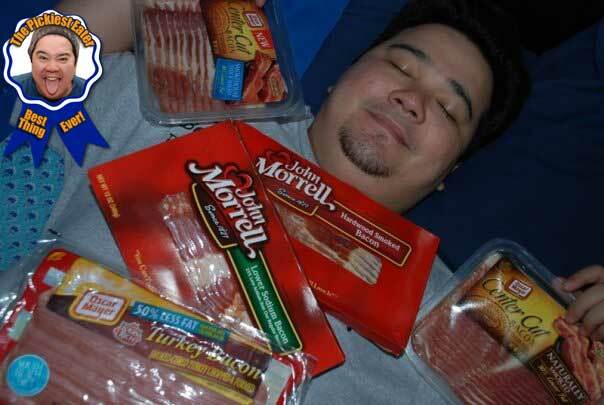 She sent me three packs of Oscar Mayer bacon (Center Cut Naturally Smoked, Center Cut Smokehouse Thick Sliced, and Turkey) and two packs of John Morrel (Hardwood Smoked Bacon & Lower Sodium). The Turkey and the Lower Sodium was for my diet. I think. Hehe..
Bacon really is one of the best things ever. Nuff Said. Thank you so much Ninang Pochay, and to my cousin Nana who lugged these bad boys all around with her for thousands of miles... Love ya Love ya Love ya!! The other weekend, Rina and I had some visitors over. My friend Karen came over with one thing on her mind. Bacon. She kept posting about her cravings throughout the week, and even called me out on it. Since I received a generous donation of bacon from some people at work, I graciously obliged. Rina & I prepared BBQ Beef Ribs, Ginataang Kalabasa and Oriental Fish, but all Karen could think about was the bacon. I knew I had to do something about it, because I know what it feels like to be a slave to the heavenly slices of pork known as bacon. She was actually quite pleased. There were just so many people in my facebook posting stuff about bacon that I had to post this! Join the Bacon Revolution! Wouldn't this be the coolest machine, ever!??! I know some people who'd feel the kilig you felt over this post. :D Haha. Bacon machine FTW! Haha! You know it, Leslie! haha the bacon is long gone, gay.. very sorry.. hehe actually.. no i'm not! the bacon is mine!! oooohhh... this may be long overdue, and i don't know if you can still read this comment, but you love bacon too. sigh, a blogger after my own heart, este, stomach. in a morbid conversation with my brother, he told me, "ate, if you're dying of cancer, i suggest you forgo the chemo. 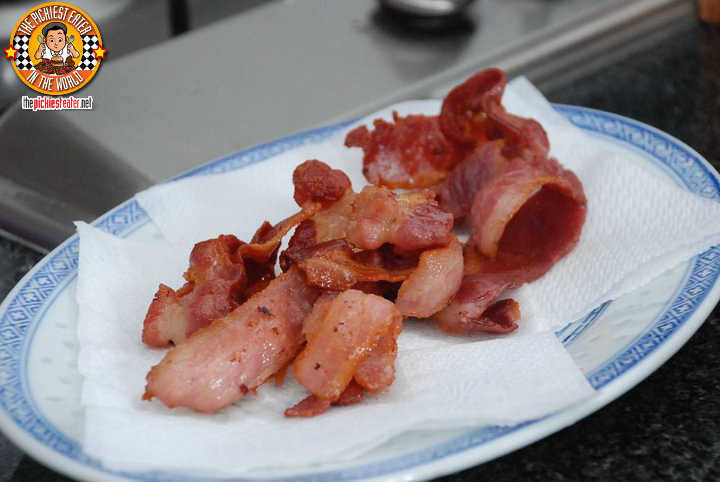 just eat lots of bacon. you'll die anyway, but at least you'll die happy."